It’s been a long four years since the Calgary Flames last won a playoff game (yes, really), so last night’s decisive win over the Colorado Avalanche was a definite cause for celebration. Taking a two-goal lead in the second period and all but sealing the deal with an empty netter late in the third, the Flames got their first round of the 2019 Stanley Cup Playoffs off on the right skate — largely due to a shutout performance by Mike Smith (who also got an assist! ), closing out the third with 4-0. The crowd at the Saddledome was on their feet for a large part of the game, and the celebration spilt out onto 17th Avenue following the big win. 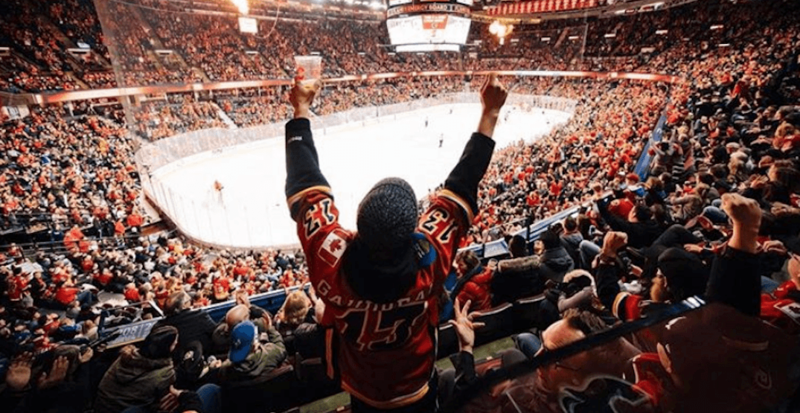 As the game was being played, huge crowds also gathered at the Flames Playoff Launch Party at the Big Four Building, giving the fans that didn’t manage to snag a Game 1 ticket the opportunity to celebrate surrounded by an electrifying atmosphere.